Yesterday Samsung finally confirmed that they are working on the Samsung Galaxy S III mini, a 4” version of the 4.8” Galaxy S III. The launch will be happening later today but we don’t have to wait till then to get a preview of what they have to offer because there’s a leak for that. Fresh out of the tap is the leaked specs and pricing for the not quite so mini Samsung Galaxy S III Mini. We all know that it’s going to have a 4” display, which isn’t very small if you ask me, it’ll be a Super AMOLED display of WVGA resolution powered by a ST-Ericsson U8420 chipset with a dual-core 1GHz CPU and 1GB of RAM. 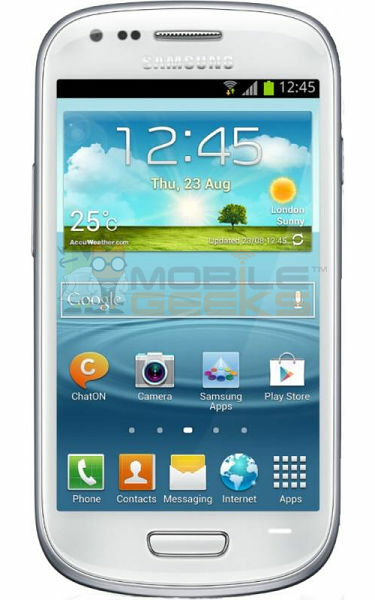 Software wise, it’ll be packed with Android 4.1 Jelly Bean at launch with none other than TouchWiz interface. The back will come with a 5MP shooter while the front will be of VGA quality. No further information have been given about video but given the specs, I think it’ll most likely be 720p. Other specs include 121.6 x 63 x 9.9mm dimension, 3G, HSDPA, Bluetooth 4.0, DLNA, microUSB port, 16GB of internal storage expandable via microSD, 1,500mAh battery and finally for the price, it will priced at USD$515, approximately RM1,600 – not quite as mini either. So are you looking forward to the Galaxy S III mini or Galaxy Note II that will be launched here in Malaysia later this evening? Stay tuned because we’ll be there to give you live updates so if you haven’t already, do follow us on Facebook and Twitter. Nominate The Next Cover Girl For Stuff Magazine Malaysia!